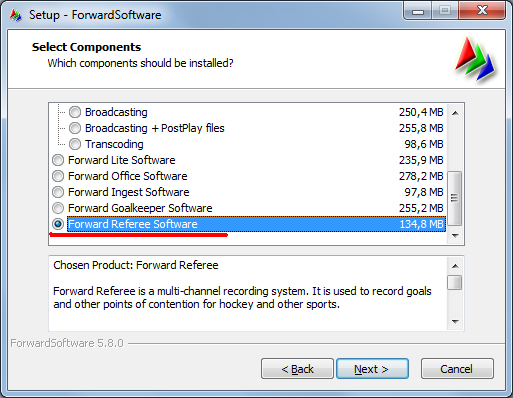 One ForwardSoftware_Setup installer contains software for the following products: Forward T, Forward TS, Forward Goalkeeper, Forward Lite, Forward Office, Forward Referee, Forward Ingest. Software that works with FD322, FD422, FD722, FD842, FD788 board contains the drivers for listed boards. The software presented in this section can work with FD322, FD422, FD722, FD842, FD788 boards with any serial number. For some FD842 boards you may need to reflash it. Contact our technical support department for instructions. The installer will install the full set of SoftLab-NSK codecs. If you do not know which of our products you have a license for, please contact our techsupport with your board number or HASP-key. How to find out your board's or HASP-key numbers you can see here. Choose the software that you will be using and click the corresponding link to view the installation instructions. Insert the boards into the computer. 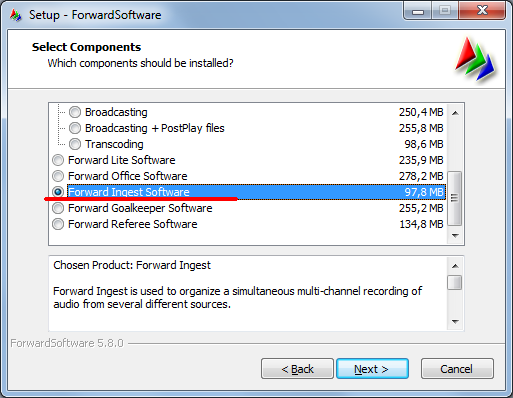 Start the ForwardSoftware (FTP, 198M) installer and follow its instructions. Choose the product in question when prompted. Install the USB HASP-key drivers. Important: It is necessary for you to plugin the HASP-key into the computer's USB drive. The rest of the installation must be completed with an inserted HASP-key. If the product set includes input/output boards, they must be installed before you install the software. 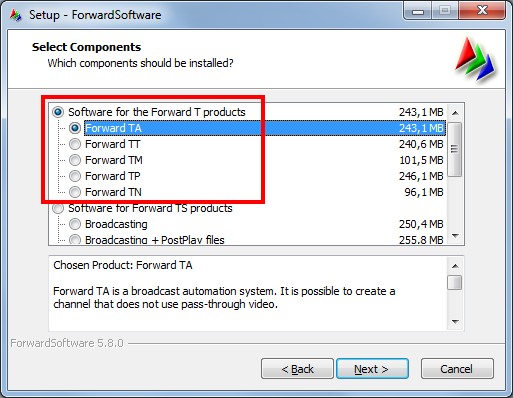 Plugins are additional program options for Forward T and Forward TS products, purchased separately. A temporary (up to 3 months) license for any plugin is freely available. To obtain one, please contact our techsupport with your board number or HASP-key. How to find out your board's or HASP-key numbers you can see here. This installer contains the following plugins: AutoDetect, SLStreamCapture, SLNewsTitler, SLTelephone, SLNewsLine, RemoteOnAir, IPCamera, IPOut/ASIOut, IP2PostPlay, PostPlay Export, MXF Playback, SLScreenCapture, Srt2Teletext, SLSocials, APTO stream processing (Linear Acoustic), SLSplicer, SLSportTitler, SLAdsRemover, NDIVideo. Specifications of plugins are here. 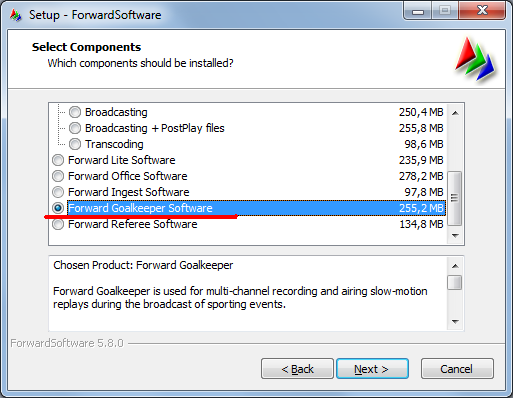 Install the most recent version of the ForwardSoftware (FTP, 198M), if not already installed. 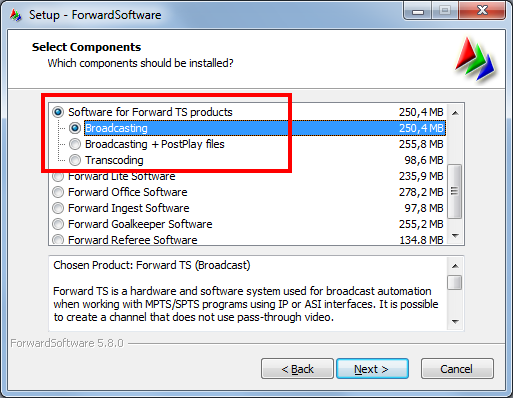 Start the ForwardPlugins (FTP, 49M) installer and follow its instructions. Choose the product in question when prompted. Allows an unlimited amount of individual stations when working on preparing a broadcast. Does not include board drivers or any programs that require a board. 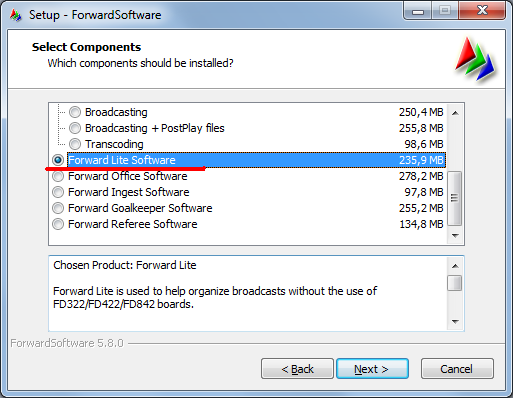 The Forward Lite software is free. The "board-less" mode is described in detail here (section "Viewing broadcast on a computer without a board. SLTitlePreview Program."). Driver installer for HASP USB-key for Forward TS.